Eye and vision examinations are an important part of preventive health care. Many eye and vision problems have no obvious sign or symptoms, so you might not know a problem exists. Early diagnosis and treatment of problems can help prevent vision loss. Diabetes is the leading cause of vision loss for Americans under the age of 74, and Doctors of Optometry are dedicated to early diagnosis and timely treatment to prevent diabetes related blindness. 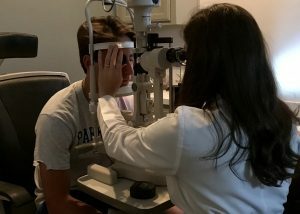 Optometrists perform the majority of comprehensive, dilated eye examinations for people with diabetes in the United States and are well versed in the treatment and management of diabetic eye disease. Including Glaucoma, Macular Degeneration, and Cataracts using the latest technology for retinal scans and photos. We love fitting our patients in the latest contact lens technology! Our Doctors will recommend the best brand for your during your exam. We want you to see your best and feel your best. Dry eye syndrome (DES) is a chronic condition that develops when your eyes do not produce and maintain enough tears to keep the eye's surface lubricated. Dry eye is a common condition in which a person doesn't have enough quality tears to lubricate and nourish the eye. Tears are necessary for maintain the health of the front surface of the eye and for providing clear vision. Dry eyes can be a chronic condition, but your optometrist can prescribe treatment to keep your eyes healthy and comfortable and to prevent your vision from being affected. The primary approaches used to manage and treat dry eyes include adding tears using artificial tear solution, conserving tears, increasing tear production, and treating the inflammation of the eyelids or eye surface that contributes to dry eyes. We can see you the same day to help you with pink eye/eye infection, or sores eyes, foreign body removal and other eye emergencies. According to experts, 80% of learning is visual, which means that if your child is having difficulty seeing clearly, his or her learning can be affected. 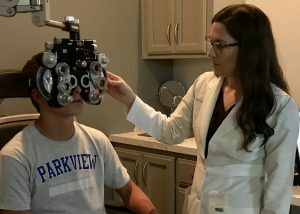 To ensure that your children have the visual resources they need to grow and develop normally, their eyes and vision should be checked by an optometrist at certain stages of their development. Accent Vision Care has the experience and equipment necessary to diagnose and often treat the eye disease at our office. For more information please schedule an appointment with your optometrist. Schedule your visit today!